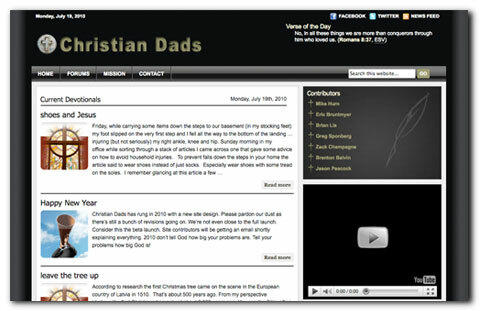 Christian Dads website is dedicated to men looking for inspiration and community. ChristianDads.com is run on WordPress and has several site contributors, all with unique logins. Online Store: I set up affiliate programs that produces revenue. Forums: Set up phpBB forums and customized it to match the main site. Verse of the Day: The site runs a plugin that displays new verses daily. I set up an inspirational picture to go with the verse. I like to rotate images to make a static column look dynamic. Video: Used embedded video to spruce up the site. Helps the site look more modern and interactive. Forum Buzz: Used Java script to pull in recent comments made in the forums. I just love how you designed my website from just a business card. You did a great job of making my concepts and ideas come to life. I get compliments on my website almost daily. I have recommended your web service to all my friends.